There is something that is both ironic and perversely democratic about this photograph. 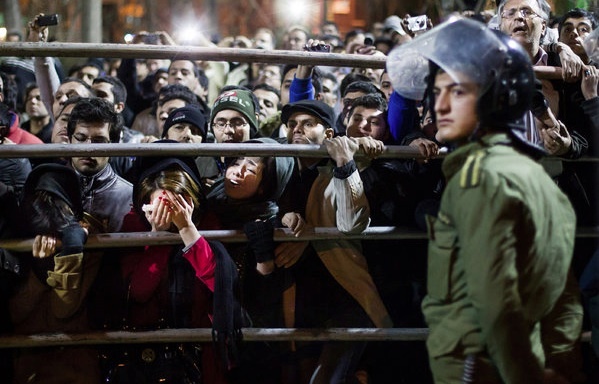 The location is Tehran Square in Iran and the people on the other side of the barricade are witnesses to a public hanging. Many are photographing the event, some appear to be looking in anger or in anticipation, others reveal expressions of pain and grief or simply cannot look at all. But all are public spectators to a state sponsored execution. To understand the irony and the perversion you have to remember that there has not been a public execution in the United States since the hanging of Rainey Bethea in Owensboro, KY in 1936, despite the fact that there have been 1,320 state sponsored executions between 1976 and 2013. The irony, of course, is that Iran is run by an autocratic dictatorship while the U.S. is an open democracy, but at least in this instance the former, it would seem, is far more open and transparent than the later. Iran’s motivation is hardly democratic inasmuch as the purpose for the public spectacle is to serve as a brutal warning rather than to inculcate the legitimacy of its actions, and hence it is in this sense a perversion of democracy, but there is also something compelling about the idea that if the state is going to exact such punishments that the public—and not just a hand full of journalists—ought to stand in witness to the action. We don’t endorse the death penalty at NCN, but the larger point here is that it seems fundamentally undemocratic to engage in such an extreme form of punishment outside of the public eye and apart from the full participation of the people. If we think of the above photograph in cinematic terms as the “shot,” then this second photograph might function as the “reverse shot” or what the spectators are viewing. In Barbie Zelizer’s terms, we might call it an “about to die” shot. But what makes it important for our purposes is how it captures the complexity of emotions that the spectacle of a public execution can put on display. What is particularly telling is how even the hoods designed to conceal the identity—and not incidentally the affective responses—of the executioners are ultimately incapable of masking what can only be a moment of human compassion as the hangman on the left comforts one of the individuals about to meet his fate. And one can only wonder if the reason we don’t have public executions in the United States is because we are afraid of letting the public witness the brutality of the punishment, or alternately, is it because we don’t want them to witness the displays of ambivalence of those responsible for performing their charge as executioners? You left out the spectacle of the drunken, tailgate party atmosphere that would be present in many of these affairs, if not dominate in certain parts of our country. If capital punishment was a deterrent as its supporters insist, then the states that perform executions should do them in broad daylight in the public square for all to see. That they are typically done under the dark of night away from crowds in the US creates the aura of something shameful, which in fact it is. Shameful in every way–executions in the US are about vengeance not justice, about political power and social oppression, and about the blood list that exists in so many of our citizens.